Key Difference: The stem of the plant is responsible for providing support to the leaves, flowers or fruits of a tree. On the other hand, a trunk of a tree provides a structure for the whole tree, including stems, leaves, flowers and fruits. The trunk also connects the leaves to the roots. Stems and Trunks are common words that are heard in botany. They are a part of a plant and are different from each other, though due to them both being part of a plant may cause confusion for some people. The trunk is the main structure of the tree that supports the whole tree. The word stem usually refers to a plant, while a trunk refers to a tree. A stem of a plant is one of the two main structural axes of a vascular plant. The stem can be divided into two parts; node and internodes. The internodes are responsible for holding the buds or new leaves, while the internodes are the distance between two nodes. The stems are located on the structure of the plant known as the stem and have four basic functions. The stems are responsible for providing support to the leaves, flowers, fruits and other stems, transport of liquid between the roots and the rest of the plant, storing nutrients and producing new living tissue. A plant has multiple stems and the lifecycle of a stem is from one to three years. 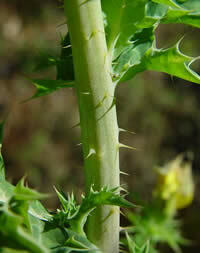 Some plant stems are consumed as food. 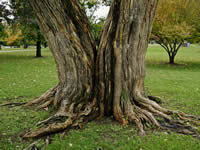 A trunk or bole refers to the main structure of the tree, which is responsible for supporting the whole tree. The trunk is responsible for supporting the branches and connecting the tree to the roots, allowing it to access necessary nutrients for survival. The trunk is covered in bark, which differs in texture compared to the stem. It is also covered in rings that help determine the age of the tree. The trunk of a tree may not have leaves sticking out of it. The trunk and the bark have important uses in industrial applications such as lumber, paper, furniture, structures, construction, etc.